Visitors to the Henn-na Hotel east of Tokyo will be met by a pair of giant dinosaurs with tiny bellboy hats perched on their heads. It might be about the weirdest check-in experience possible, but that’s exactly the point at the Henn na (whose name means ‘weird’) chain, which bills itself as offering the world’s first hotels staffed by robots. 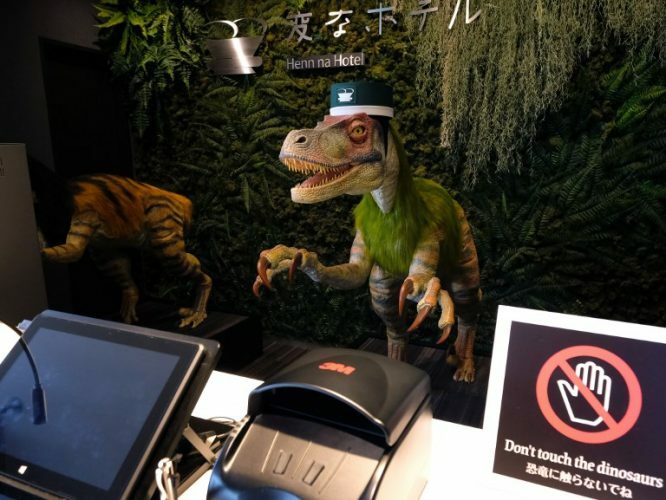 The front desk staff are a pair of giant dinosaurs that look like cast members of the Jurassic Park movies, except for the tiny bellboy hats perched on their heads. The robo-dinos process check-ins through a tablet system that also allows customers to choose which language – Japanese, English, Chinese or Korean – they want to use to communicate with the multilingual robots. The effect is bizarre, with the large dinosaurs gesticulating with their long arms and issuing tinny set phrases. Yukio Nagai, manager at the Henn na Hotel Maihama Tokyo Bay, admits some customers find it slightly unnerving. “We haven’t quite figured out when exactly the guests want to be served by people, and when it’s okay to be served by robots,” he told AFP. 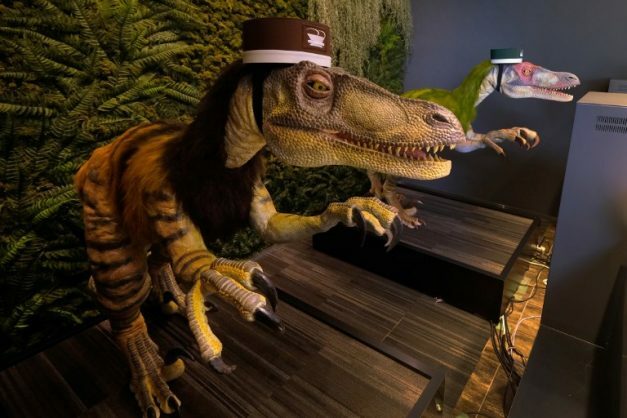 A robot dinosaur wearing a bellboy hats welcomes guests from the front desk at the Henn-na Hotel in Urayasu, suburban Tokyo on August 31, 2018. But for other guests the novelty is the charm: each room is staffed with mini-robots that look a bit like spherical Star Wars droid BB-8, and help guests with everything from changing channels to playing music. Even the fish swimming in the lobby run on batteries, with electric lights in their articulated bodies flickering on and off as they work their way around giant tanks. “The dinosaurs looked intriguing, and I thought my son would love it,” said Chigusa Hosoi, who was at the hotel with her three-year-old. The first Henn na Hotel opened in Nagasaki in 2015, and was certified the following year by Guinness World Records as the world’s first hotel with robots on its staff. The travel agency group that operates the chain now runs eight hotels across the country, all with robots on the staff, some of them dinosaurs, but others taking a more humanoid shape. Some humans are also on call to intervene in case of glitches, which customer reviews online suggest are a not infrequent problem at check-in. But Nagai said relying on robots for everything from front desk duty to cleaning had proved an efficient choice in a country with a shrinking labour market.